Order online this Glamorous Love N Care Gift Hamper for the people who deserve your love and special attention. 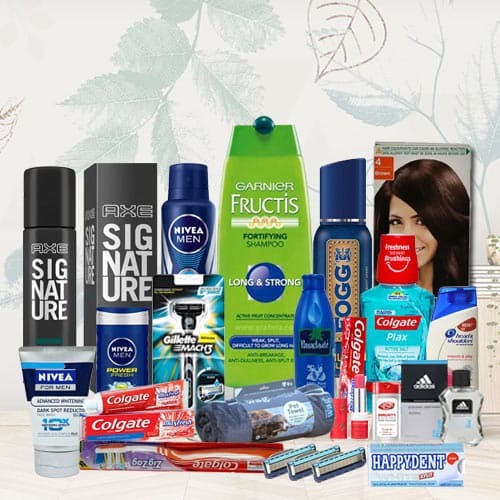 This Gift Hamper consists of Nivea Deodorant - Fresh Active for Men (150 ml Bottle), Axe Signature Intense Perfume + Deodorant (122 ml Carton), Fogg Fragrance Body Spray Bleu Island (120 ml), Garnier Color Naturals - Natural Black No. 1 (40 ml), Garnier Fructis Conditioner - Normal Fortifying (180 gm), Parachute Coconut Oil (175 ml), Head N Shoulders Anti-Dandruff Shampoo - Smooth N Silky (80 ml), Colgate Mouth Wash - Plax Active Salt (250 ml Bottle), Colgate Toothbrush - Zig Zag (Medium 1 pc), Colgate Toothpaste - Max Fresh Cooling Crystals Red Gel - Spicy Fresh (150 gm), Nivea Shower Gel - Power Refresh for Men (250 ml), Nivea Advanced Whitening Face Wash - Oil Control (100 ml Tube), Lifebuoy Nature Pure Hand Sanitizer (55 ml), Lip Balm, Gillete Razon, Cream, Aftershave, Brush, Blade, Chewing Gum (Mint flavour) and Shower Towel.